I Love You More Than Carrots: Fall Faves and Heading Over to the Dark Side. out with a coffee stirrer. - dark hair and dark nailpolish! As summer draws to a close, I can't help but get into the Fall spirit early by making a few lifestyle changes. Enhacements, if you will. And I'm not talking about changing out my closets or packing away the beach towels for another ten months. Because I've already done that. I'm talking about the yearly switch from my Spring and Summer 'do to something a little more cool-weather appropro. switching over to a dark mahogany. i think i'm in love! and my [other] new favorite Fall accent? I love it SO much that it's even taken the place of my usual fave, Linkin Park After Dark! What are some of your Fall faves? You love it more than lincoln park?? I'm going to have to give it a try! I loooove that color of OPI. Other things I like about fall: apple cider and my glitter pumpkins I pull out of storage. Oh that color is super cute. I love wearing dark nailpolishes, and I love busting out my peacoats. yay for fall and winter!! Oooh loving the dark hair! I am obsessed with eggplant for my nails right now, but that color is purty. I wish everyone would stop making me jealous with this fall crap. Its 90 degrees and humid in Orlando right now. I've already made the switch to dark fingernail polish, especially the plum color. I love it! The lady at the nail salon yesterday tried to talk me into going dark even though I tried to explain to her I am getting married in a month and have too many pretty showers to go to... After Nov 1 I will be dark once again though. 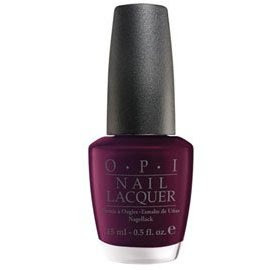 I also just picked up a couple of darker purple OPI polishes...I didn't see that one, I might have to go back! I freaking love your hair darker! 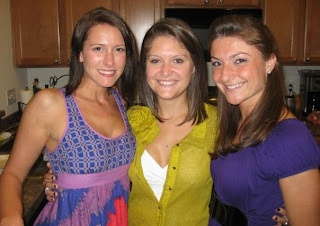 You are so lucky that you look fabulous as a brunette or a blonde! Isn't it so fun to switch up looks based on the season?! I'm definitely going to be on the lookout for that polish! i never get tired of hearing about fall! your hair looks great, it really compliments your skin tone. i used to play the light/dark game every spring and fall but haven't gone dark for about 3 years. i keep getting the urge to go dark but get scared and chicken out. my husband has never known me as a brunette. i love love that nail polish, will have to pick up some. ps- i smiled at your comment yesterday, you and sully (and your shoe stringless hubby too!) are always welcome in texas! i love the dark hair! I do the same thing- the colder the weather the darker i make my hair! I just really look forward to picking pumpkins and apple cider! HAHA! That is soo meee...I have to show my routine hair change from summer highlights to the fall color! I can't wait for dark nailpolish too! I have to try that one bc linkin park after dark was always a fav! Have a super weekend! Your hair looks great dark! I just had my first pumpkin spice latte yesterday... loves! I love that OPI shade! I love that OPI nail polish! I love dark nail polish! I'm def going to have to try that new one. Ooh, that is quite a statement about that nail polish - I will def. have to try it! Fall is my favorite season - you name something about it, I guarantee I love it!